15 Wells Ct #2, Hampton, VA 23666 (#10245195) :: Abbitt Realty Co. This second floor condo offers an open floor plan with a family room, kitchen and bar area great for entertaining and kitchenette. There are laundry hook-ups available in utility closet. Open the doors to a private balcony and relax during the summer or join the fun at the private pool. With ample parking in this gated community this may be the perfect solution for your students out there who wish to live off campus. 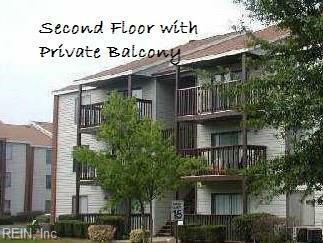 This condo is near Hampton University, Langley Air Force Base and even NASA of Langley. Investors looking for a rental income - ask for details on rental rates for the area.